Ever deliberated over planting the red Dahlias there, the purple Hydrangeas there, or the pink Chrysanthemums here? Well, sooner than you might think, you could have all of the colors you want, all in one flower. Scientists at Revolution Bioengineering (RevBio) are working on applying biotechnology to consumer products by creating a unique flower that changes colors throughout the day. Keira Havens and Nikolai Braun at BioRev are working to make the field of biotechnology more accessible and appealing to the general public. They are doing this by creating Petunias that change color from red to blue and back to red throughout the day. 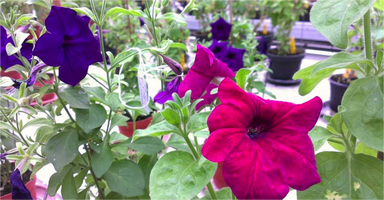 In order to create these flowers, RevBio will be using two features already found in Petunias. The first is the molecule responsible for colors in flowers, called anthocyanin. Anthocyanins are pigment molecules that create the red, purple, and blue colors in flowers, and their properties can change based on the environment. The second is an internal clock plants use to track sunlight and regulate the expression of different genes. It works in a cyclical way, telling the plant when to start photosynthesis for example. 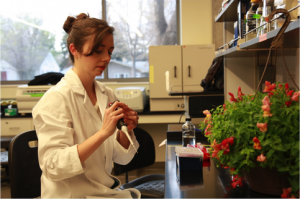 RevBio is working to connect these two mechanisms– so that the expression of anthocyanin is connected to the natural cyclical rhythms of the plant, resulting in a plant that changes color based on the time of day. So far RevBio has successfully tested this pathway in bacteria and has moved on to working on single plant cells. “Petunia Circadia is just the start – we can imagine blue flowers, flowers with polka dots, flowers with new scents and textures to brighten up the home and the garden… As we perfect our color technologies, we’re looking forward to developing more sophisticated, functional plants for use – detecting environmental pollutants or reducing pest infestations just by changing the color of a flower. There is a colorful future ahead!" Modern biotechnology provides breakthrough products and technologies to combat debilitating and rare diseases, reduce our environmental footprint, feed the hungry, use less and cleaner energy, and have safer, cleaner and more efficient industrial manufacturing processes. Thanks for putting out top notch content all the time. I would like to be here again to find another masterpiece article.